The Hall | The inside view of politics and government in Chicago. The campaign committee supporting Garry McCarthy’s possible run for mayor has reported receiving a $5,600 contribution from Rudy Giuliani, the former New York City mayor and one-time Republican presidential candidate. The contribution is the maximum allowed under Illinois election law. Attacking Hillary Clinton for not visiting Ground Zero after 9/11, despite pictures showing then-Senator Clinton there, together with Giuliani, the day after the attack. Claiming to be the architect of Trump’s Muslim immigration ban. His public statements admitting that it was based in religious bias became part of the court case to overturn it. Claiming to have insider information from within the FBI regarding a coverup of Hillary Clinton’s emails. Stating that radical islamic terror attacks in the U.S. didn’t start to happen until Barack Obama was elected president, which of course was 7 years after the 9/11 attack occurred. Repeating Trump’s statement that Obama founded ISIS. Saying that black children have a 99% chance of killing each other. Defending Trump against accusations of sexual harassment. Not exactly the guy you want at your side while you’re running for mayor of Chicago. McCarthy was a Deputy Commissioner of the New York City Police Department under Giuliani, and he notably set up and ran the emergency command center on 9/11, working side-by-side with Mayor Giuliani and his staff. As of December 31, 2017, McCarthy’s campaign fund had $1,572 on hand, and has reported receiving $9,100 more since then (including the Giuliani contribution). By comparison, Emanuel’s campaign finished the year with $2,085,393 cash on hand. Chicago Public Schools CEO Forrest Claypool should start thinking about updating his resume. If Mayor Rahm Emanuel’s past actions are any guide, Claypool will soon be out of a job. The choice of Claypool as CPS CEO was controversial from the outset. Now, however, Claypool’s actions have landed him in hot water in recent weeks, and it is likely the mayor now sees him as a distraction and a liability. Last month it was reported that Claypool stonewalled a group of aldermen during a private briefing about CPS finances and then proceeded to called Ald. Susan Sadlowski Garza (10th Ward) a liar when she raised concerns about funding cuts to her local schools, causing some class sizes to balloon to more than 40 students. “That’s when Claypool said, ‘That’s not true, I don’t believe you,’ ” says Garza, whose account was backed by Waguespack. Everyone in the room was shocked to hear a mayoral appointee essentially call an alderman a liar. Then a week later came a report that the CPS Inspector General found that Claypool had engaged in a “whitewash” of an ethics violation by his longtime friend and hand-picked top lawyer. It was previously reported that Claypool allowed CPS General Counsel Ronald Marmer to supervise work done for CPS by his former law firm, an apparent violation of CPS ethics policies. IG Nicholas Schuler has now found that six lawyers consulted by Claypool told him Marmer’s actions were indeed ethics violations. Claypool kept opinion shopping until, on the seventh try, he finally found a lawyer who would agree with his claim that Marmer had not committed any violations. Emanuel has a clear pattern when dealing with high profile appointees who are under fire or rumored to be departing. When it first comes up in public he makes a clear statement of support. As more time goes by and he is asked about it repeatedly, Emanuel curtly expresses his support, and then shortly after he fires the appointee. “Nothing makes me prouder than to introduce my good friend, Forrest Claypool, who at every level has always left an incredible, indelible mark on the departments he has run,” Emanuel said while introducing Claypool during a City Club of Chicago luncheon. “Yeah. Yeah. 100 percent,” the mayor said as he walked out of the event. Leading up to, and throughout, the 2012 teachers’ strike, stories circulated that then CPS CEO Jean-Claude Brizard was on the outs with Emanuel. On September 19, 2012: “JC has my confidence,” [Emanuel] said. A similar dynamic played out between Emanuel and Police Superintendent Garry McCarthy following the release of the LaQuan McDonald video. Emanuel spokeswoman Kelley Quinn said in a statement that the mayor full[y] supports Superintendent McCarthy. “This incident is a tragedy and it’s absolutely unacceptable, but Jason Van Dyke’s actions are not representative of the Superintendent McCarthy’s values, or of the hard-working men and women of the Chicago Police Department,” Quinn said. Less than 24 hours later Emanuel fired McCarthy. It’s time to start the Claypool countdown. Despite its incredibly blues musical heritage, Chicago has failed to use that heritage to promote tourism, losing out to New Orleans, Memphis, and St. Louis. And now, even Fargo, North Dakota is getting in on the act. Last week I escorted my daughter to an ice skating competition in North Dakota (the things we do for our kids). 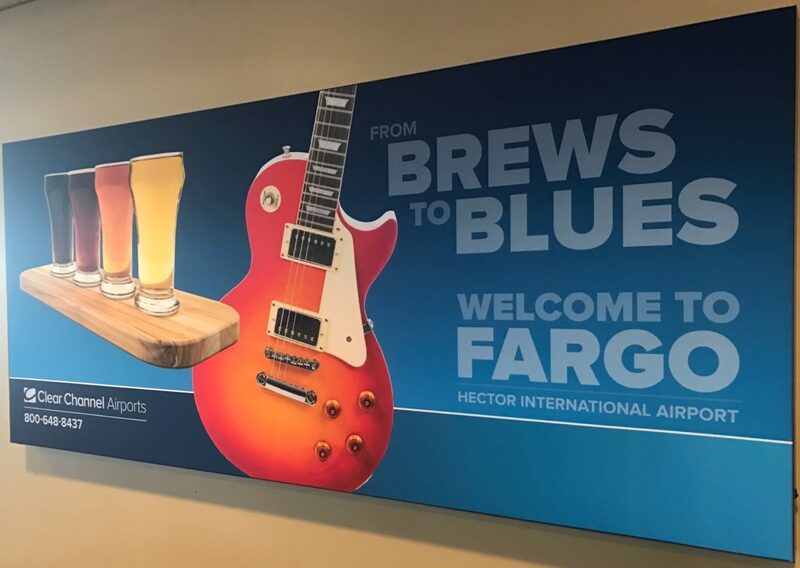 Sitting in the Fargo airport waiting for our flight home, I was confronted by a billboard touting Fargo as a destination for the blues. Who knew? CHICAGO, April 1, 2016 – Mayor Rahm Emanuel will announce a bold and dramatic new police reform agenda at a press conference later today, in an effort to address the recent surge in violence in Chicago as well as the ongoing police accountability scandal, The Hall has learned through multiple sources. The details of the policy agenda were shared with The Hall by a senior Emanuel administration official who requested to remain anonymous due to not being authorized to speak publicly on the matter. According to the source, the new policies include holding police officers accountable for the crime rates in their beats and districts, and also making it easier to fire police officers for underperformance or discipline problems. The City reportedly will implement a major new tracking system, allowing for a data-driven approach that breaks down crime statistics by district, beat and individual officers. “This new system will allow officers to be evaluated on the true measure of their job performance, which is the crime rate in the community they are serving. Numerous studies have shown that the number one factor influencing crime in a community is the police officer, and their ability to deliver a quality policing experience,“ said the anonymous source. The administration source also pointed to the many steps required to fire a police officer, making it virtually impossible to get rid of an officer who isn’t measuring up. Emanuel’s new plan will streamline the process, allowing quicker action. The policing reforms will be paired with cost saving measures that will require police officers to work longer shifts without additional pay, and will close underutilized police stations. To smooth the transition to the new system, Mayor Emanuel will implement a merit pay program that will reward officers who outperform their peers. The city will also move to close five police stations on the south and west sides of the City, and consolidate the associated districts. “These areas of the City have seen dramatic population declines,’ said the administration source. “More than 200,000 residents have moved out of those districts, and based on a new police station utilization formula we developed, those five stations are now considered underutilized, and are a financial strain on the cash strapped department.” The source declined to explain the utilization formula. The final item on the agenda is a pilot project to “Turnaround” a low performing police district. Which district is subjected to the Turnaround has yet to be determined. All of the police officers in the district will be replaced, and the district management will be turned over to a private entity. Emanuel will announce today that the City has signed a $20 million no-bid, sole source contract with Urban Police Leadership, a joint venture of Bechtel and Omni Consumer Products, to manage the Turnaround district. Urban Police Leadership has also agreed to donate $1 million to fund the merit pay program, although sources insisted there was no connection between the donation and the awarding of the contract. 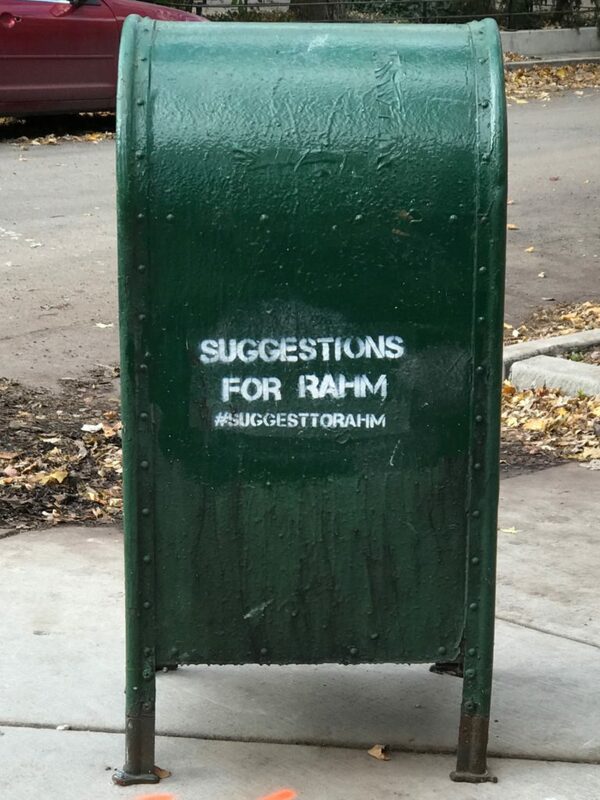 These changes come as Mayor Emanuel is besieged on all sides. The courts recently stuck down his pension reforms, Governor Rauner has made clear there will be no relief from Springfield, and public opinion polls have consistently shown Chicago residents siding with the CTU over Emanuel by a wide margin. The Chicago Police Accountability Task Force will not release its report today as originally planned. Late on a Friday afternoon a few weeks ago, the Task Force quietly released a statement with the news that it intended to delay the release of its report. When Mayor Emanuel created the Task Force in December, he set a deadline of March 31st to report back to him. While only a delay of a couple of weeks, the action dredges up the skepticism held by many regarding the Task Force. “We have to be honest with ourselves about this issue. Each time when we confronted it in the past, Chicago only went far enough to clear our consciences so we could move on,” Emanuel said. Still, the task force was seen by many as yet another press conference sound bite that would ultimately result in yet another report that would gather dust on the shelf. After all, that was what had happened to a previous report commissioned by Emanuel just a year earlier. We set an initial goal to deliver our report laying out our recommendations for reform to Mayor Rahm Emanuel and the Chicago City Council by the end of March. However, we have decided that more time is needed to complete our work. We will use this additional time to further develop our findings and recommendations as well as continue to engage relevant stakeholders so that we can set the stage for meaningful and long-lasting change. We anticipate delivering the report in mid-April. Mayor Emanuel announced the formation of the Task Force the same day he fired Police Superintendent Garry McCarthy, as he tried to staunch the furor that erupted following the public release of the LaQuan McDonald shooting video. The test now will be whether the report is released in mid-April, or is delayed further. Former Alderman and mayoral candidate Bob Fioretti’s personal bio states that he is an adjunct professor at Northern Illinois University (NIU) Law school. Turns out that’s not quite true. He earned his law degree from Northern Illinois University College of Law, where he remains a member of the adjunct faculty. This can be found on his campaign web site, his law firm’s web site, his Facebook profile, his LinkedIn profile, Wikipedia, and many other sources. Yet the NIU Law School faculty directory does not list Fioretti’s name. Employment records provided by NIU in response to a Freedom of Information request show that Fioretti was hired to teach a class on State and Local Government for a four month period in the Spring of 2000. For this he was paid a $2,000 honorarium and reimbursed for travel expenses. In other words, Fioretti taught a single class at NIU 16 years ago, and based on that is claiming that he “remains” a professor today. Fioretti is challenging State Sen. Patricia Van Pelt in the Democratic primary for the 5th district in the primary election next Tuesday. Fioretti is not the only Illinois politician in hot water for stretching (falsifying?) the truth about his past. Downstate Sen. Sam McCann (R-Jacksonville) is trying to survive his claims of having been a member of the Marine Corps and receiving an Honorable Discharge, despite no records or documentation backing up that claim. Within the span of two days this week, two well respected voices put forward drastically different visions of the Lakeside Center building at McCormick Place. The backdrop: the entire McCormick Place complex and the surrounding lands have been mired in controversy for months regarding the plan to build the Lucas Museum of Narrative Art along the lakefront. Several alternative proposals have been offered to move the Lucas Museum and make better use of the area, but it appears that the only options being considered are to keep it in the proposed location next to Soldier Field, or move to another city. Preservation Chicago believes this is one of Chicago’s great mid- century modern buildings. It is also the world’s largest space-frame structure, and a feat of engineering in its day. Talk in the past has also turned to demolition and replacement. The next day, Blair Kamen wrote about an idea from Helmut Jahn for the future of the building. As both Kamin and Preservation Chicago note, Jahn was one of the designers of the building nearly 50 years ago. 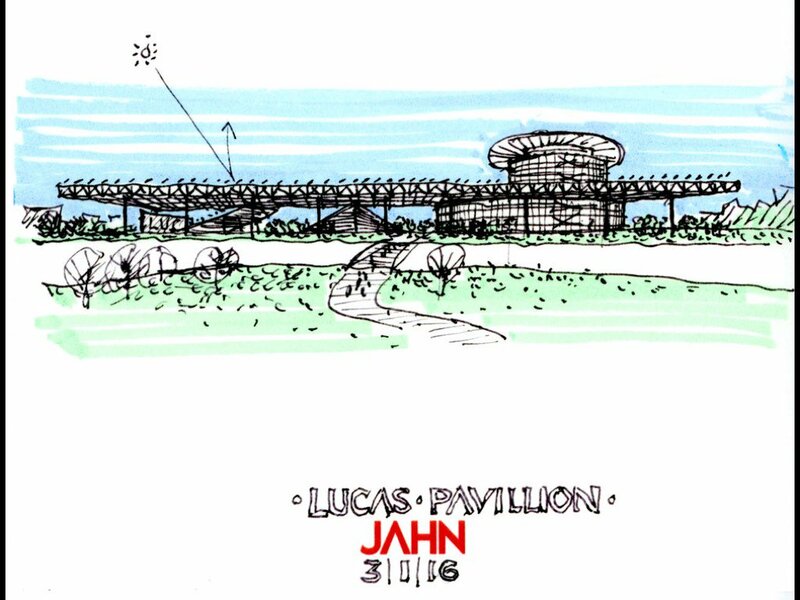 Rather than preserve the building, Jahn proposes to remake it, and place the Lucas Museum on the site. A sketch from architect Helmut Jahn, which proposes stripping McCormick Place’s Lakeside Center down to its bones and adding a curving museum pavilion that would pop through its boldly overhanging roof. By transforming the building into a giant trellis, he makes it less wall-like and more porous, putting most of the ground beneath the big roof back to a public use. The new Lucas Museum could be inserted within this framework, creating a visual dialogue between old and new, void and solid, rectilinear and organic. There will surely be more twists and turns as the museum project moves forward (or doesn’t). Mayor Emanuel stated today that there is no need for the U.S. Department of Justice (DOJ) to investigate the City of Chicago Law Department. This comes in the wake of sanctions against a City lawyer who lied about the evidence in a police shooting case. Sound familiar? That’s because he said the same thing about the possibility of a DOJ investigation of the Police Department, a day before he reversed his position, and less than a week before the U.S. Attorney General announced that the DOJ would be investigating. Similarly, in both cases Emanuel downplayed the possibility of a broader problem or conspiracy by utilizing the ‘One Bad Apple’ storyline. Emanuel has repeatedly underestimated the impacts of police-related scandals in the past few weeks, and this has further fueled the backlash he’s been experiencing. We’ll see if that is the case here as well.